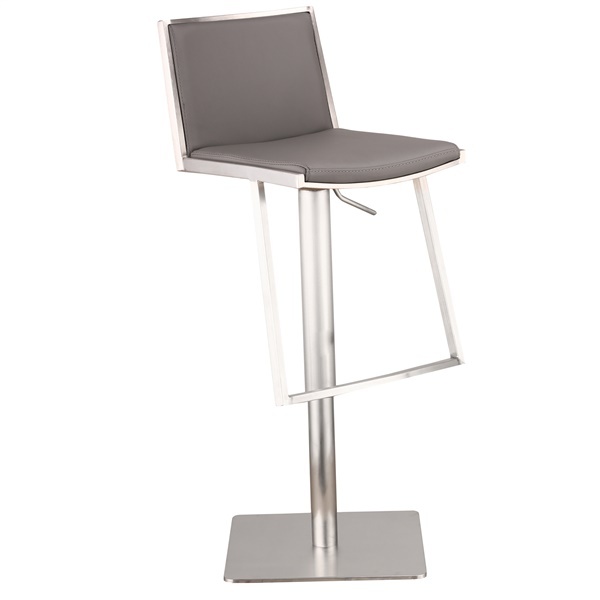 The Ibiza Adjustable Bar Stool from Armen living is an ultra-modern option when you are looking for new bar furniture. It features a finish of brushed stainless steel. The adjustable height and modern design make it a great option for anyone who is in need of new furniture for a bar. The stool has a durable, stable steel construction and chair base that makes it both comfortable and stable to sit in. The height is adjustable and the stool includes a footrest to make it even more comfortable. It can be used with the other items in the Ibiza collection or by itself in any modern setting. Expertly upholstered in durable polyurethane. Gleaming brushed stainless steel finish. Complements other Ibiza pieces by Armen Living. Does the height adjust on this stool? The height of the Ibiza Adjustable Stool is adjustable, with a seat height range between 21 inches to 31 inches.